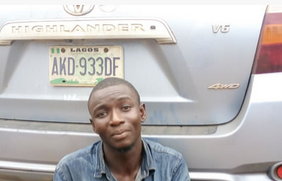 A car wash attendant in Abuja, Afeez Ayo, has been arrested by the police for allegedly stealing a customer’s 2008 Toyota Highlander SUV and taking it to Lagos on a joyride. Ayo, a holder of an Ordinary National Diploma, was said to have changed the number plate of the vehicle and driven it to Ibadan from where he picked four passengers en route to Lagos. The suspect was arrested at Agodi Junction, Ibadan on his way from Lagos by detectives from Apo police division, Abuja in collaboration with the Oyo State Police Command. The Federal Capital Territory police spokesman, Anjuguri Manzah, explained that the owner of the SUV, Mrs. Adenike Sani, had left the car with Ayo at a car wash at the Apo Resettlement Centre, Abuja only for the attendant to disappear with the vehicle along with a Tecno phone belonging to a lady. On getting the report of the theft, detectives were said to have tracked the vehicle to Oyo State where it was recovered and the suspect apprehended. Ayo told our correspondent on Monday that he stole the SUV to get back at the management of the car wash facility for planning to relieve him of his job. “I took the vehicle to get back at the owner of the car wash because he had asked another person to take over the facility’s management. I was afraid when I got to Lagos and I decided to bring back the vehicle, but I was stranded,” he stated. The 23-year-old said he conveyed four passengers to Lagos from Ibadan and charged them N500 each to raise money to fuel the SUV. Asked how he managed to beat the many security checkpoints on the highway, Ayo explained that he refused to stop when waved down by policemen. “Policemen stopped me about five times, but I refused to stop. Please forgive me, I will change. I will learn a skill and work,” he pleaded as policemen laughed at him. Manzah advised motorists against leaving their car keys with car wash attendants, noting that incidents of car theft were on the rise.